A new bias-corrected statistically downscaled product, namely, the NASA Earth Exchange Global Daily Downscaled Projections (NEX-GDDP), has recently been developed by NASA to help the scientific community in climate change impact studies at local to regional scale. 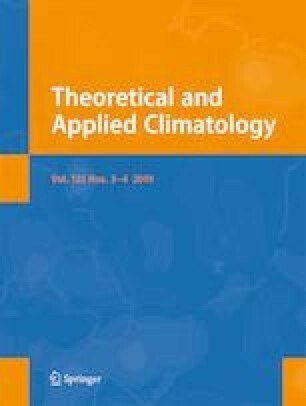 In this work, the product is validated over India and its added value as compared to its CMIP5 counterpart for the NCAR CCSM4 model is analyzed, followed by climate change projections under the RCP8.5 global warming scenario using the two datasets for the variables daily maximum 2-m air temperature (Tmax), daily minimum 2-m air temperature (Tmin), and rainfall. It is found that, overall, the CCSM4-NEX-GDDP significantly reduces many of the biases in CCSM4-CMIP5 for the historical simulations; however, some biases such as the significant overestimation in the frequency of occurrence in the lower tail of the Tmax and Tmin still remain. In regard to rainfall, an important value addition in CCSM4-NEX-GDDP is the alleviation of the significant underestimation of rainfall extremes found in CCSM4-CMIP5. The projected Tmax from CCSM4-NEX-GDDP are in general higher than that projected by CCSM4-CMIP5, suggesting that the risks of heat waves and very hot days could be higher than that projected by the latter. CCSM4-NEX-GDDP projects the frequency of occurrence of the upper extreme values of historical Tmax to increase by a factor of 100 towards the end of century (as opposed to a factor of 10 increase projected by CCSM4-CMIP5). In regard to rainfall, both CCSM4-CMIP5 and CCSM4-NEX-GDDP project an increase in annual rainfall over India under the RCP8.5 global warming scenario progressively from the near term through the far term. However, CCSM4-NEX-GDDP consistently projects a higher magnitude of increase and over a larger area as compared to that projected by CCSM4-CMIP5. Projected daily rainfall distributions from CCSM4-CMIP5 and CCSM4-NEX-GDDP suggest the occurrence of events that have no historical precedents. Worth noting is that the extreme daily rainfall values projected by CCSM4-NEX-GDDP are two to three times larger than that projected by CCSM4-CMIP5. The authors sincerely thank the anonymous reviewer and the editor for the helpful suggestions that have significantly helped in improving the paper. The DST Centre of Excellence in Climate Modeling at IIT Delhi, and the Science and Engineering Research Board (for research grant ECR/2015/000229) are thankfully acknowledged for support. The use of the CMIP5 outputs and IMD dataset are thankfully acknowledged. We thankfully acknowledge the use of the NEX-GDDP dataset prepared by the Climate Analytics Group and NASA Ames Research Center using the NASA Earth Exchange, and distributed by the NASA Center for Climate Simulation (NCCS).